Maximize your inventory potencial, connect to a large network in one simple click. the largest online index for independent agencies connected to a growing lead generation network. For over 18 years, we have been providing the independent car rental industry with millions of online reservations through multiple channel programs - all through the use of our powerful CRX Booking Engine. Enables your agency to accept online reservations directly at your company’s website and/or through our Travel Partners’ sites. Be sure to convert your users into bookings by connecting to the CRX multiple channel partners that offer high conversion rates effortlessly. 18 years of customer feedback, join CRX and enjoy the renter rated program. Using the CRX dashboard, you will be able to setup and manage all of your agency details and watch the reservations pile up! 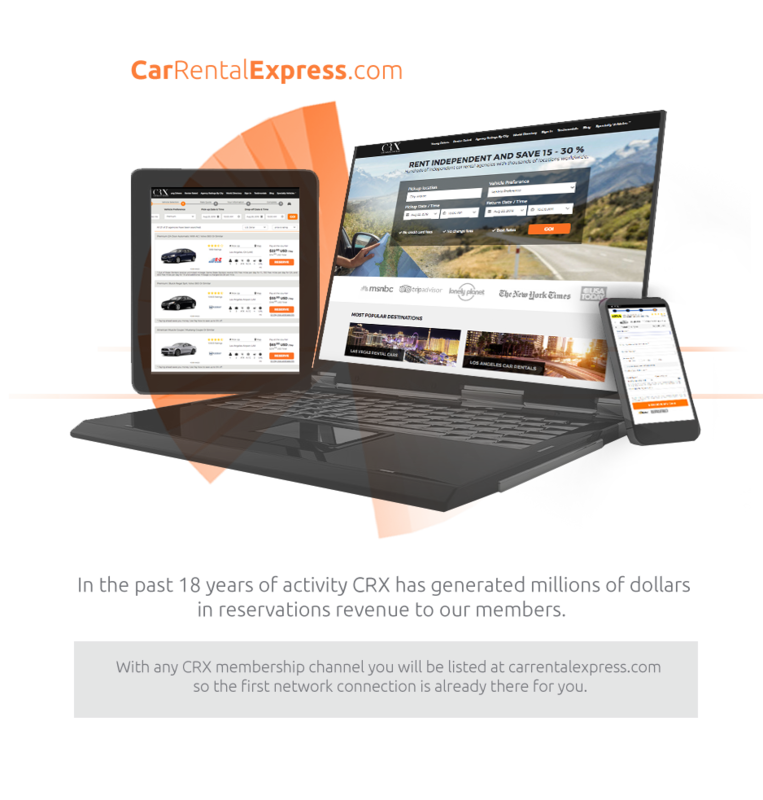 CarRentalExpress.com is the only car rental website on the Internet that is dedicated solely to Independent Agencies, local operators and mid-tier franchises. CRX agencies are presented over the Internet to a global renter base. CarRentalExpress.com is developed in-house by ExpressITech and powered by the CRX Booking Engine. The site was entirely rebuilt and relaunched in March 2018 and is optimized and ready to drive reservations to your agency. Getting your company listed at Car Rental Express is easy! Our web, browser-based user interface, CRX Manager makes it easy to enter agency vehicles and rate data. Compatibility with your existing RMS is an option with the CRX Basic or CRX Pro Memberships. Agencies at Car Rental Express become part of a team - a team big enough to compete with the majors. CRX Agencies are able to be listed at other large websites like Kayak.com, Skyscanner.com and more! Making sure things work means also fine-tuning the User Experience (UX). Our user-friendly system provides renters with a smooth, clean rental process thus increasing agencies’ conversion rates. Renter Rated is a Program developed by Car Rental Express that provides your renters with the opportunity to share their rental experiences. At the end of their rental, renters are encouraged to rate your agency based on 9 criteria. All renters’ ratings are tallied – the more ratings your agency has, the more reliable the star rating value you will have. Categories of service can have ratings up to 5 stars (exceptional). It is important that new renters have the opportunity to know about your company before committing to a rental. If they see that past customers had a great rental experience with your agency, they will be more likely to go ahead and book with you. Your agency may get fantastic ratings on some criteria while only barely passing others. This is a great tool for you to use to see where you are thriving and conversely, where you need to make changes. Customers are not shy – and since the Renter Rated Program allows some anonymity, renters will be inclined to be truthful in their ratings. This metric can only help your agency grow. The CRX Team constantly upgrades the user experience in order to help your agency grow its online presence and monetizing of your inventory. We have assisted, encouraged, and helped develop our agencies since 2000, making them stand out in the competitive online travel industry. Join us and be part of the biggest independent rental network worldwide. Want to work with us? Partners for success are welcome at CRX! CRX Booking Engine (Desktop and Mobile) at your agency website. The price includes 1 domain, thereafter $99 per each additional domain. Don’t take our word for it, take theirs. I have been with Car Rental Express since 2001 and rely on their reservation system to bring in a lot of my business. SuperCheap has a unique business model in that our main focus is longer-term rentals, particularly to students. I need a reservation system that can give my customers the best price, yet listen to the rules we set forth….and CRX Booking Engine does this. State Van Rental has worked with CRX since the very start of our business almost a decade ago. On top of the fact that we’ve received volume of reservations over the years, the staff at CRX have always been there alongside us and worked with us through our challenges. My sincere thanks to everyone at CRX for the energy and effort they have put in our business, its growth and success. The system has been serving us very well and the system support has been excellent. The CRX reservation system is an integral part of our day-to-day business, and of our overall success. In 18 years of doing business with CRX/EIT I can honestly say that the CRX staff have always put us and our success as a priority. They run their business with Honesty, Dependability, and Reliability. CRX/EIT has always been a partner in our success. I thank them very much for almost 20 years of friendship and support. Our customers complement us on how easy it is to reserve a vehicle with us. In their words they say the (Car Rental Express) search on the main page was quick and that completing the reservation was slick, concise, and that the process works well. For me that means that my customers reserve with us, and come back to us. Registration process is fast and easy. In case of problems our friendly support is happy to help! Activate your listing and be noticed world-wide. Copyright 2018 - Express Internet Technologies inc. All rights reserved.